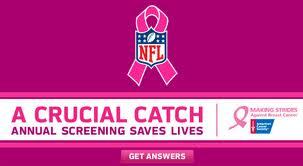 Pink NFL – Does Anyone Care? The NFL is completing its breast cancer awareness week, where many of the players, cheerleaders and fans wear pink and encourage women to get their mammograms. 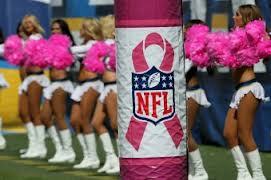 Several players and commentators mentioned during the game losing mothers, sisters, and wives to breast cancer. This is just one of many efforts in the last few years, including the Susan Komin Race for the Cure and other programs. But has it worked? Sadly, the answer is no. Over the last several years, women are getting about two percent less screenings. There are 250,000 new cases of breast cancer each year. Around 50,000 are in women 40 to 50, but those tend to be the most quickly growing types. That is why women over 40 are asked to get checked once per year. There are also 5,000 men per year that develop breast cancer and sadly, they are usually unaware until it is too late. Women over 50 are at the highest risk, yet studies show that older women often believe they are “passed the time to worry about breast cancer” at the very time they are at highest risk. Part of this is the preponderance of TV ads that show young women in breast cancer ads. The odds of getting breast cancer before 40 are slim indeed. Here are some charts showing breast cancer screening rates. Early detection can make breast cancer much more treatable and less costly. The later it is detected, the higher the cost and the greater the mortality. It is also important to know that some breast cancer appears as a rash on the breast, not a lump. Get any irregularities checked immediately. Source for graph data: National Center for Health Statistics. Health, United States, 2009: With Special Feature on Medical Technology [PDF-10.5MB]. Hyattsville, MD. 2010. The graph below shows the percentage of women aged 40 years and older who had a mammogram in the last two years, grouped by race and ethnicity. *Estimates for Native Hawaiian or Other Pacific Islander are considered unreliable and are not shown in this graph. †The group, or category, called “Hispanic” may include race categories like white, black, American Indian/Alaska Native, and Asian/Pacific Islander. The percentages of mammography screening vary by education level. Women with the most years of schooling are most likely to have had a mammogram in the last two years. The graph below shows the percentage of women aged 40 years and older who had a mammogram in the last two years, grouped by their highest level of education. The percentages of mammography screening vary by age. Women aged 50 to 64 years are most likely to have had a mammogram in the last two years, followed by older women and younger women. The graph below shows the percentage of women aged 40 years and older who had a mammogram in the last two years, grouped by age. So what can be done? The Valley Schools Employee Benefits Trust (VSEBT) has teamed up with SOLIS, Mobile Onsite Mammography (MOM) and United Healthcare (UHC) to provide programs and incentives for women through their Wellstyles and other programs. While nationally testing rates are going down, VSEBT has been successful in getting their membership rates to increase early detection. The screenings are tied to wellness points and prizes and/or to lower premiums for healthcare. Fighting cancer is an uphill battle. Despite the massive publicity, fewer women are taking the critical step to get regular screening. To contact VSEBT to find out more on how you can improve your rates, talk to Andrea Billings or Sheri Gilbert at 623-695-5982.